The 2011-2012 academic year will undoubtedly go down in the laurels of Alpha Psi history as one of the most memorable in our proud 129 years of tradition. In a year that saw the resurgence of Alpha Psi within both McGill University and the McGill Greek community, Alpha Psi was able to hold steadfast to the principles of truth, love, fidelity, honor and friendship in respect to her fraternity, Zeta Psi and our founders, Brothers Sommers, Skillman, and Dayton. The year began as always with the annual Zeta Psi Convention. The event saw well over 400 Zetes from across North America and the British Isles, including a record 22 Alpha Psi Zetes convene in New Jersey City. At the Convention, our Alpha Phi, Brother Pierre Lapaine, was honored with the reception of the distinguished Undergraduate Zete Award and the Chapter won her second straight Gold Chapter Award commemorating the grand effort the Chapter made in the previous academic year. The banquet dinner was truly an event to behold with a record number of attendees and the honoring of Brother Gregory McElroy, past Executive Director and Phi Alpha, for his services to our fraternity, Zeta Psi. Brother McElroy, as our reactivation class will fondly remember, was a very influential Zete in our Chapter’s history as he was the IHQ traveling consultant who originally met with Phi Gregory Aikins in 1978 about restarting Alpha Psi at McGill University. Alpha Psi Zetes were able to leave the Convention with a renewed vigor and focus towards their fraternity and the hopes of embarking upon a new quest towards bringing Alpha Psi closer to the levels of our most respected Chapters. Over the course of the academic year, the Chapter was able to reach unprecedented levels of scholarship, initiation, service, and involvement as the Chapter took a big step towards solidifying itself as a true force once again within Zeta Psi. Long the Alpha Psi Zetes had read of the glorified halls of our predecessors of the early 1900s and it was only in this academic year that Alpha Psi set out on a mission to reach those once gloried days. In terms of service, the Chapter was able to stick to a steadfast plan developed by Philanthropy Chair Brother Brian Farnan. This past year, the Alpha Psi Chapter itself raised over $10,000 of charitable donations for various organizations within Canada. Furthermore, in a renewed effort to bring philanthropy to the forefront of Alpha Psi, the Brothers were able to contribute well over 1000 individual volunteer hours for the community. Perhaps the most memorable service occasion of the year was in November with a repeat appearance of the Brosaica dance team at CASCO. Brosaica, an all male dance ensemble formed by Alpha Psi Zetes in 2009, was in its third year of being and saw a record number of Alpha Psi Zetes participate. The dance/fashion show saw over $20,000 raised towards the Montreal Children’s Hospital. The riveting performance by the Brosaica troupe was headlined by the dance stylings of Brother Maximillian Gubert and the savagery of newly minted Student Society Vice-President Internal, Brother Michael Szpejda. When considering recruitment, one must look no further than the dedication of Rush Chairs, Brothers Chase Potter and Joseph Feldman, to see why Alpha Psi had such a remarkable year. In welcoming both the Beta Beta and Beta Gamma classes, Alpha Psi was able to add a new wave of Alpha Psi Zetes committed towards taking Alpha Psi to new levels. The Beta Beta class, initiated on November 12, 2011 saw 18 new members join the Alpha Psi ranks and the Beta Gamma class, initiated on March 17, 2012, brought 8 more for a full year total of 26 new members. It was with great enthusiasm that Alpha Psi was able to welcome three legacy members to our Chapter this year with the initiations of Brothers Jeffrey Mead, John Hopkins-Hill, and Stephen McGuire who will carry on the traditions of Zeta Psi just as their own family members have before them. The sheer number of new initiates this year speaks largely to the goals of Alpha Psi of taking a much larger involvement within the school community and finding Brothers from all walks of life in order to build a stronger Chapter. In this very year, Beta Beta class member Brother Alexander Rohrbach was honored with the reception of the Canadian University Field Lacrosse Association’s Rookie of the Year award. One of the considerable goals Alpha Psi had this year was to get out within the Zeta Psi community and visit their Brothers at other Chapters. Over the course of the year, Alpha Psi Brothers were able to visit over 30 of Zeta Psi’s Chapters and relate with Brothers from all over the world. In addition to hosting a Leadership Training Institute in March, Alpha Psi was very happy to welcome over 10 Chapters visiting them throughout the year, easily a record in recent memory. However, without a doubt, the crowning moment of the year was when 18 Alpha Psi Brothers were able to travel to Dalhousie University to help with the re-initiation of the Alpha Mu Chapter, just like Brothers of the Alpha Psi Chapter did in 1938 with the original founding of the Dalhousie Chapter. The Brothers of Alpha Psi were very happy to welcome the 21 new Alpha Mu Brothers to the Circle of Zeta Psi and cannot wait to visit them each year in the hopes of keeping our relationship strong. In addition to participating at the Alpha Mu Chapter, Alpha Psi was able to play a hand in the reactivation of the Theta Phi Chapter at Western University. Several of our Brothers were able to make the trip to London, Ontario where Alpha Psi Zete, Adam Weryha, was able to see his brother, Phi Daniel Weryha, initiated as the first Theta Phi Zete of the reactivation Chapter. Alpha Psi is very excited to see the growth we have experienced in Canada and the Zeta Psi Fraternity this year and looks forward to the efforts made in the colony at UBC next year with yet a few more younger brothers of Alpha Psi Zetes taking the helm in the reactivation effort. With the end of the year came the new slate of student elections at McGill University. A stated goal of the Chapter this year was to become more involved in student life during these tumultuous times in the province of Quebec, thus the Chapter had many candidates up for election across the school board. In what amounted to an unexpected turn of fortune, Alpha Psi Zetes will be strongly represented in student government next year with brothers sitting on the boards of the Student’s Society of McGill University (SSMU), Management Undergraduate Society (MUS), Arts Undergraduate Society (AUS) as well as the Heads/Chairs of many campus clubs and groups. Most notably, SSMU’s Vice-President Finance and Operations, Brother Jean-Paul Pilon-Briggs will be the de-facto head of the campus bar, Gerts, long known as a common Zete watering hole. Also, in terms of Greek life, Alpha Psi Brothers decided to make a renewed commitment towards the rest of Greek life on campus and will return Alpha Psi by means of Brothers John Hopkins-Hill, John Charles Digiulian, and Alaistair Jones to the Inter-Greek Letter Council Executive in the roles of President, Vice-President Finance, and Vice-President Administration respectively. Finally, in what was a bit of a revolution of sorts, Alpha Psi experienced a great deal of growth and increase in participation in its Elders ranks. Beginning with the now annual Zete Patrick’s Day to the Elder Softball game, Commemoration and the End of Year Banquet, Alpha Psi Elders showed up to events with renewed passion. Without a doubt much of the credit here must go to Elder Brother Charles Madon whose phone campaign initiative led to Alpha Psi reconnecting with many Elder Brothers lost along the way over the years. Also, one must not forget the great efforts of Elder Brothers James Madon, Charles Madon, Adam Weryha, and Brock Clancy (currently in the role of Chapter Advisor for International Head-Quarters) in traveling with the Actives to help with the reactivations at Alpha Mu and Theta Phi this year. A special acknowledgement must be given to Brother Gregory Aikins who, as he seems to have a knack for, played a crucial role in the reactivation effort at Alpha Mu this past year. Also, a special commendation must be sent to Brother Barth Gillan who was able to take the time to attend the chartering of the Theta Omicron Chapter in Dublin, Ireland on February 25, 2012. However, the highlight of the Elder calendar this year had to be the Commemoration dinner on November 12th, 2011where over 90 Alpha Psi Zete’s broke (and threw) bread at the Black Watch Armory. Much thanks must go to the Elder Executive Board led by Elder Phi Anthony Zitzmann, Elder Alpha Phi Alpha Alec Humes, and Elder Sigma Barth Gillan who made a stead-fast commitment to the Active Chapter this year in assisting them with meeting many of its goals. The Elder Chapter will no doubt be happy to welcome the 12 graduating brothers of the Alpha Psi Chapter including Zete of the Year honoree, Brother Ryan Mead and past active Phi, Brother Pierre Lapaine, as well as a group of individuals who truly helped shape the scope of Alpha Psi over the past few years. Although you will all be missed by the Active Chapter we know that you will continue your efforts to shape the Elder Chapter and improve Alpha Psi in the years to come. In all, it was a truly successful year for the Alpha Psi Chapter and we wish all of our Brothers in Zeta Psi a good summer vacation. We hope to see you all up in Montreal in the coming months and we cannot wait to come down to your events next year. To all of our Brothers across the world, we cannot tell you how proud we are of all of you and proud to belong to the best fraternity in the world, Zeta Psi. 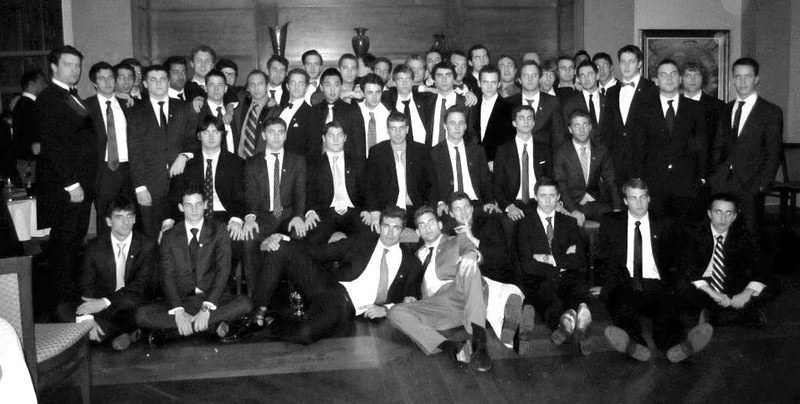 The Alpha Psi of Zeta Psi. Right to Play McGill: Save the Children!